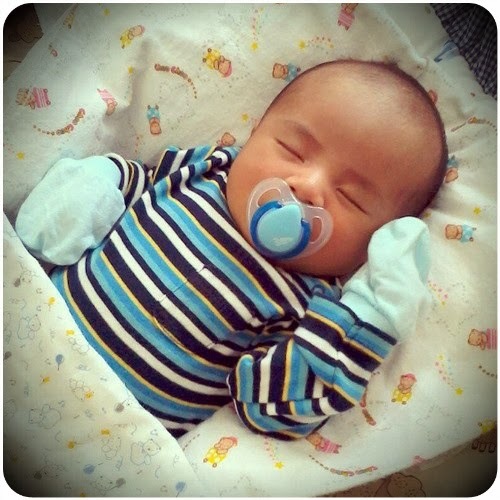 My first nephew,Ahmad Umar Harith bin Muhamad Anuar, the one that I'm looking forward to meeting all the time, the other guy that I love so much beside my Abah & A.H & ultimately, one of my sources of joy turned 2 years old on 01/10/2015. I felt a bit emotional you know, as if I was the one who carried this boy in my uterus for 9 months. Kudos to my Sister for doing so anyway. Lols! Sigh! Do you know that you were so quiet when you were that small? Lols! 24 months later, many things have changed. 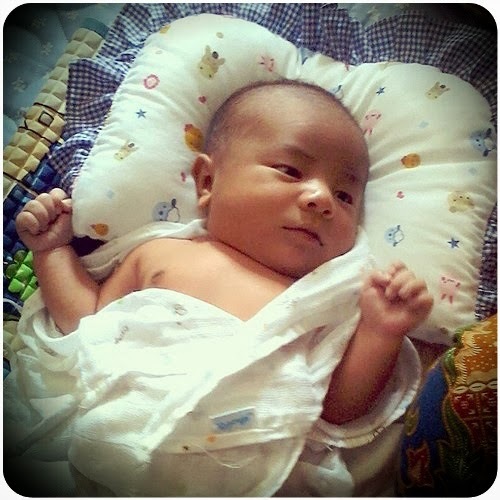 From 3.4 kg, you're now 18kg & getting heavier day by day. I'm not only being among a few who still larat to dukung you, but also had washed your yakyak a few times. But nobody can beat Tok Abah who has become your no. 1 yakyak washer (is there a word for that? ), then it's your Papa Su whenever he's not working & available at your service. Lols! Now let see some of your latest photo at 2 years old, shall we? Once in a while whenever your Ummi & Abi were busy, you would sleep here at Tok Ma & Tok Abah's house (Papa Su & Mama live with them too. And probably when you read this, we're still living there). Honestly, we always look forward for that! 14/10/2015. But like other grandparents, they kalah with you jugak most of the times. Lols! But when you two meet under one roof; you two are inseparable! 19/10/2015. Papa Su had to attend a course at HRPZ II that morning, so he had some extra time in the morning to accompany you watching Upin Ipin. Bahagia betul Umar tatkala ini. Lols! You like watching Upin Ipin, Robocar Poli, Teletubbies & any random ABC/123/Alif Ba Ta videos on Youtube. For the time being, this is your favourite Youtube video. You'll smile, clap your hand & wiggle your body a bit when you watch this. Agak confused di situ ya but anything to keep you happy! Although we allow you to watch Youtube videos, it's not always Youtube time all day long. We encourage you to be adventurous, playful & just let you grow up like a normal boy/toddler as possible. Some people have different view/opinion/principle on this but I think I'll be a type of (future) mom who wants my (future) kids to be not so focused on learning per se at a very young age. Don't get me wrong, I do want my (future) kids to be smart but why can't we just let them be toddler/kids & just let them play while they can? 15/09/2015. While Umar busy watching Upin Ipin, Papa Su as usual busy taking your photo. Such a VVIP you are, napak peyutt! Like other aunty/uncle/grandpa/grandma, we also bought you colouring books & crayons (Oh my! So tempting that Mama Sue ended up colouring some of the pages. Lols! ), animal figurines, basketball hoop for kids (which seems to not only attract your interest malah semua peringkat umur especially your Papa Su), cars, lorries & sewaktu dengannya & all sort of toys. Your Tok Abah siap belikan Umar komik Upin & Ipin which unfortunately, you aren't yet at the age where you know how to appreciate things. Hehe! You can utter a few words already, albeit most of the times you speak in gibberish language with Japanese intonation. Haibakk! Is it because your Ummi had watched too much Japanese/Korean movies/drama while she was carrying you? I don't know. Your vocabulary is expanding now & sometimes, you said words that we didn't expect like a few days ago you asked me "Blablabla Nok gi mano? Blablabla" when you came to my room & saw me standing in front of my study table. Lols! "Ma" = for Tok Ma & Mama Sue which can also be translated for "Cantik/Comel" sometimes. Lols! And other words & sentences yang tak larat Mama Su nak list down semua. Hehe! Oh, you also love cats. Last week, Tok Ma caught you holding our Cat, Putih while naik tangga ke tingkat atas & you did it without holding to stair railings, at all! Fuhh! Kus semangat! You can be selective at eating but your most favourite food at the time being are Pulut (I'm not sure the name but yang warna brown & ada inti kacang or kelapa) & nasi kerabu. Memang ikut taste Tok Abah & Tok Ma ye? Lols! You like Vitagen & Milo kotak & ice cream and just a few days ago, I introduced you to my favourite ice cream yakni Paddle Pop & yup, you like it too based on that repeated "Hmmm dak dak!" you said. There were days when you didn't much but there were the days Tok Ma risau Umar makan banyak sangat. Most of your baju ketat kat perut, you know? 05/07/2015. "Tambah Tok Bah tambah! Jangan malu-malu"
You're also an outdoor person & you can be restless when you spend too much time indoor. Tapi sebab cuaca & sekarang jerebu, we have to be strict in letting you out. Oh ya, instead of walking, you run. You like to walk around Tok Ma's garden & see the 'Ikam ikamm'. You also like to menyibuk when Tok Ma watering her plants, you like to follow her around dengan harapan that you'll get splashed. Lols! 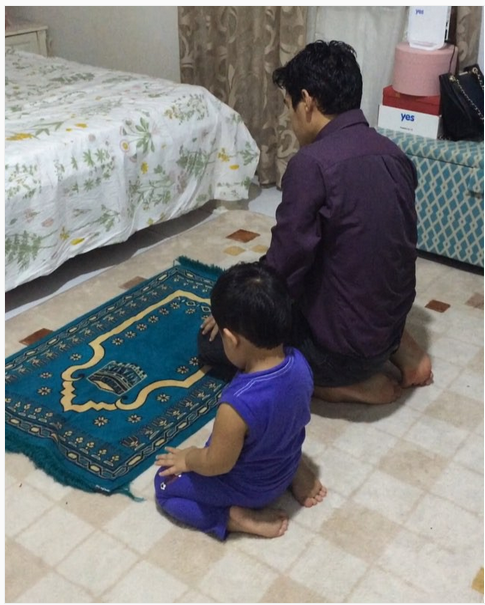 At 2 years old, you can pray on your own 5 times a day. Ok kidding. You pray whenever you feel to, especially when you saw someone's praying but Alhamdulillah, you did a good job at angkat takbir, duduk di antara 2 sujud, sujud (albeit your face didn't directly touch the ground, you tend to pusing sebelah tengok orang), duduk tahiyat & bagi salam turn your head right & left (or the other way around) & raub muka. I think, that's one of your biggest achievements. Alhamdulillah. You also show interest in mengaji & sometimes, you pretend to read Al-Quran althought the clearest part that we heard was 'Aaaacinnn!'. Lols! Ok la tu kan? We also have always asked you to recite doa makan & you take the task very seriously although you only manage to say (so far) "Blablabla Allah blablabla". Still, we are so proud of you! So, are you going to follow your Abi's footstep & go to KISAS, or go to Science School/SBP like Papa Su & Mama Sue? Or go to Maahad Tahfiz Sains like Ayah Di (Abi's younger brother)? 19/07/2015. Beraya at Mak Ngah's house in Labok, Machang. 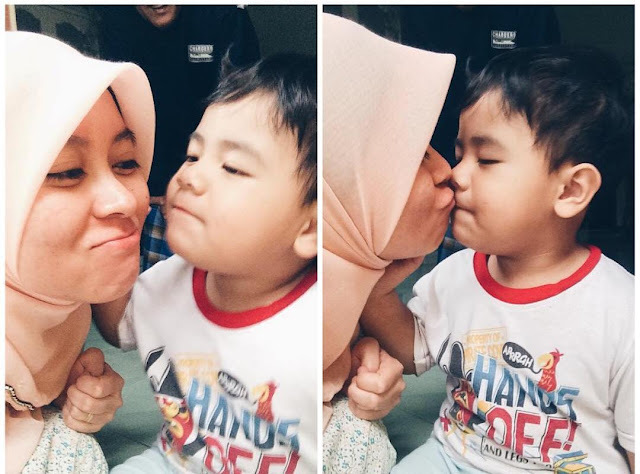 Can you tell who has the most cembung cheeks; Mama Sue, Umar or Ummi? 17/07/2015. Insisting to hold my hand while having your milk. Auww! So, what did we get for you on your 2nd birthday? Well, you see Umar. Like other obsessed uncles & aunties who like/love to buy presents for their anak buah, we always find excuses to buying you presents wherever we go & the utmost excuse we often used was 'Ni present utk Umar's birthday' (repeats this evertime we go to malls & tiba-tiba masuk toys' section. Lols!) So when you real birthday came up, we were really out idea of what to buy for you! What would you give to a 2 years old toddler who literally has everything & may I add, has enough kasih sayang from everyone? So, on the night of your 2nd birthday which you got to spend with us (Tok Abah, Tok Ma, Papa Su & Mama Sue) as your Abi & Ummi were busy with something, we brought you to this one kids' play place in KB Mall just to let you meet, sosialize, play with other kids & basically, have fun! We spent 30 minutes in there & we call tell that you had fun. It was a last minute plan & we just dressed you up with any baju we had at home because apparently, stok baju Umar yang hensem-hensem kat rumah Tok Abah & Tok Ma dah habis. It was your first time there, obviously. Kesian Umar semua orang busy, tak sempat sangat nak bawak Umar jalan-jalan kan? Tsk! Oh, do you know by next month you'll be a Big Brother? Although from time to time you kissed your Ummi's tummy, I'm still not sure whether you did understand what a bloated tummy means. Lols!